Mayor of Gangnam City Shin Yeon-Hee will sign an agreement for cooperation with Gangnamgu Medical Tourism Association in her office on July 24, 2012, Gangnamgu Ward Office announced in its recent news release. Mayor Shin will also appoint medical institutions for cooperation in the medical tourism field in a ceremony in her office on the same day. 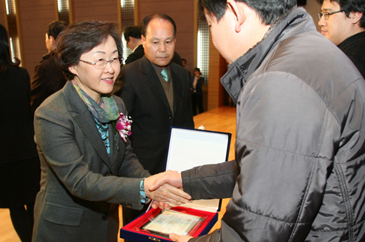 In the ceremony Mayor Shin will confer a plaque of appreciation to some of the medical institutions with her district for their high performance in attracting foreign medical tourists. Early in the year Mayor Shin appointed 155 hospitals, clinics, hotels, department stores, and other institutions for cooperation in the medical tourism. They are 28 medical institutions, 21 hotels, two departments, COEX (convention and exhibition) , and Korea International Trade Association (KITA). The recipients of the plaque of appreciation will be 16 medical institutions. They will be recognized by Mayor Shin for attracting over 500 foreign patients, respectively. The Gangnamgu Medical Tourism Association was established on June 1, 2012 and is chaired by President Lee Byung-Seok of Gangnam Severance Hospital. Gangnamgu Office said that both Gangnamgu City and Gangnam Severance Hospital will further bolster cooperation by the new agreement in the medical tourism field. The medical hospitals and clinics within Gangnam area recorded 45.3 billion won of revenue from the medical tourists, according to the news release.